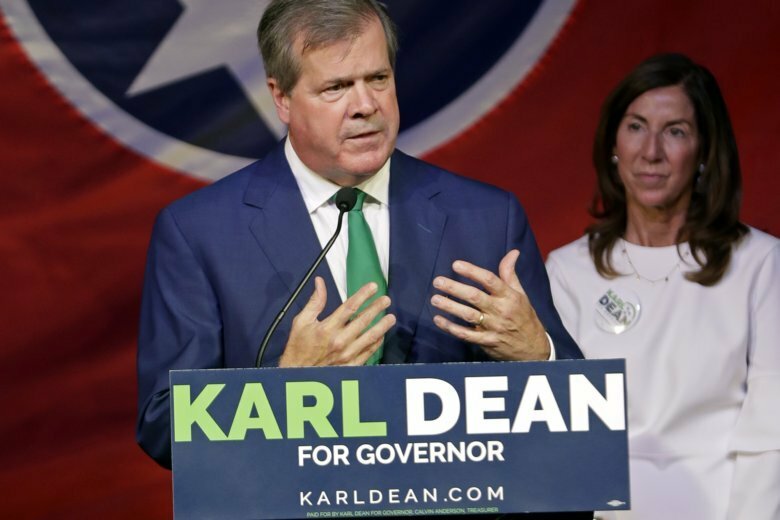 NASHVILLE, Tenn. (AP) — Tennessee Democrat Karl Dean is giving campaign trail shout-outs to Republican Gov. Bill Haslam even as Dean seeks to replace him. Never mind that the popular term-limited governor has given his full blessing to Dean’s GOP opponent, Bill Lee. For Dean, the praise has a purpose. As polls show him trailing Lee, Dean hopes to convince voters in a red state that he’s more in line with Haslam than Lee is on several contentious policy fights, and that Haslam shares his more moderate views. Dean is right on at least a few fronts. He and Haslam have advocated for expanding Medicaid under former President Barack Obama’s Affordable Care Act. Both want students who were brought or kept in the U.S. illegally as children to be eligible for in-state tuition at public colleges and universities. And they oppose a push to let teachers carry guns at school. Dean’s tactic resembles what Bredesen is trying against Republican U.S. Rep. Marsha Blackburn in a tight, open U.S. Senate race. Bredesen has commended GOP Sens. Bob Corker and Lamar Alexander, particularly where their views differ from Blackburn’s. Dean lacks Bredesen’s statewide profile and faces a tougher fight. Lee stayed positive and likable in an otherwise ugly four-way primary that tilted to the right, and doesn’t seem to be carrying much baggage as a businessman who hasn’t held political office. As chairman of the Republican Governors Association, Haslam has already starred in a TV ad endorsing Lee, calling him “the right choice to take Tennessee to the next level,” and someone who will make “the right decisions, not the political ones.” The RGA is confident enough in polling that it pulled $500,000 worth of planned Tennessee advertising. Haslam complimented Dean when asked about the namedropping, but reiterated that he’s for Lee. In his latest TV ad, Lee touts himself as a family man, chairman of his HVAC company and third-generation cattle farmer — “experience that matters,” he says. Lee didn’t address the Dean-Haslam comparisons when asked. “We’re going to 95 counties in 95 days and we’re talking about the things that matter most to me: good jobs, good schools, safe neighborhoods, and that’s what we’ll continue to focus on, and what I’ll focus on as governor,” Lee said. In Virginia, Democratic Gov. Ralph Northam campaigned on expanding Medicaid in 2017. In May he was able to push a plan through the state’s narrowly GOP-majority legislature with support from some Republicans who were happy President Donald Trump was letting states impose work requirements on Medicaid recipients. Tennessee has passed a law to ask for federal approval of TennCare work requirements without the expansion. TennCare expansion has polled favorably in Tennessee. It’s less clear whether that idea will drive people to vote this election.